All grille types can be used for walls, cabinet tops, ceilings, or floors (reinforcement may be needed for floor application). All types can be used for either supply or return. All types can be made to order in any feasable size. There are no "stock" sizes except Wainlands Standard in Stock 15° Bar Grilles. 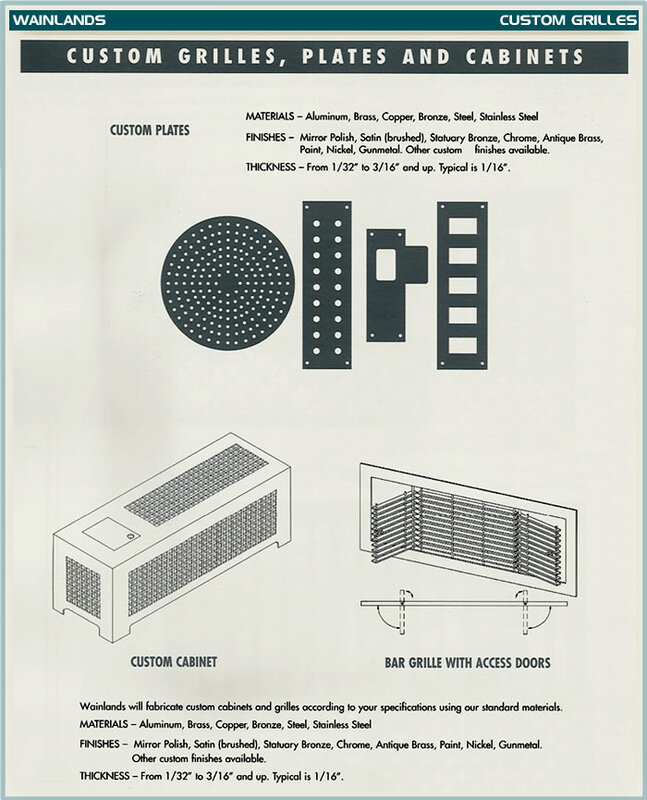 No grilles are made with dampers (operable louvers). It is possible to add this feature onto certain grilles. Amount of open area required depends on HVAC system. Forced air generally requires more than radiant systems. Constructed from individual round spindles fastened to an outer angle. Frame is similar to the type B frame for bar grilles. These grilles have zero degree deflection. See page 13 ( pdf catalog ) for illustrations & details.